Many people have misconceptions when it comes to Intermittent Fasting (or IMF), specifically I think because of the word “fasting”. People think being deprived, being hungry, and overall being uncomfortable. But IMF is actually none of those things! IMF is a term used for an eating pattern consisting of periods of fasting and periods of eating. IMF does not specifically say WHAT to eat, only WHEN to eat (however, to be healthy, make sure you are eating clean!). IMF is actually pretty easy to do, and in fact, you probably do it more often than you realize! Have you ever been late getting out the door so you skip breakfast? Or ever been so busy running errands all day you “forget” to eat? You unknowingly fasted! Hunger with IMF is not an issue, however in the beginning it can be. This is because your body will need to adapt to this new style of eating, especially if you currently eat every couple of hours. The other reason is simply your mind! You will be thinking about not eating, so you will be thinking about food, and you will think you are hungrier than you are! There are several methods for following IMF. The most common is the 16/8 Method, where you fast for 16 hours of a given day (including while you are sleeping) and consume all your calories for the day in an 8 hour window. The second most common is the 18/6 Method, where you fast for 18 hours, and eat for 6. Why does this work? When you eat a meal, your body spends 6-8 hours processing that food, burning what it can from what you just consumed. Because it has all of this readily-available, easy to burn energy (thanks to the food you ate), your body will choose to use that as energy rather than the fat you have stored. This is especially true if you just consumed carbohydrates/sugar, as your body prefers to burn sugar as energy before any other source. During the “fasted state” (the hours in which your body is not consuming or digesting any food) your body doesn’t have a recently consumed meal to use as energy, so it is more likely to pull from the fat stored in your body as it’s the only energy source readily available. Not only that, but growth hormone is increased during fasted states (both during sleep and after a period of fasting). Combine this increased growth hormone secretion with the decrease in insulin production and you’re essentially priming your body for muscle growth and fat loss with IMF! There are far more health benefits to IMF than just weight loss and fat loss. It has been proven that IMF keeps your heart healthy by increasing good cholesterol and decreasing bad cholesterol, enhances brain function, improves blood sugar, reduces inflammation, and actually helps regulate hunger. That being said, IMF is not for everyone, but it can be an amazing tool in the nutritional arsenal of most healthy adults. Always check with your doctor before giving it a try. Beyond that, I am an advocate for learning YOUR body and what YOU need. Pay attention to your own body’s cues as you learn the best approach to weight loss for YOU. You see, typical “diets” don’t take into account our own bio-individuality. We all have different metabolisms, our hormones vary, different life stressors, medical concerns, and foods that are inflammatory for us. Why then do diets try to shove all of us into one box and say “do this” and assume it will work for everyone? The only thing I believe is the same for everyone is that we should be getting enough water (which that amount still varies by person) and we should be avoiding highly processed, chemical filled foods (because those aren’t good for ANY body). Typically, everyone’s biggest concern with trying a fasting protocol is that it will put them in starvation mode, or ruin their metabolism. However, neither of these is going to happen. The fact is that Thermic Effect of Feeding (basically, using energy to digest, absorb, and use the food you eat) is determined by your total energy intake, not how often you eat. The reality is it doesn’t matter if you have 2 meals or 8! As long as you’re getting the same number of calories, the effect will be the same. According to a study in the American Journal of Clinical Nutrition, the earliest evidence of a lowered metabolic rate in response to fasting occurs after 60 hours (with an 8% drop in resting metabolic rate). That means you’d have to not eat for quite a while before it had ANY effect on your metabolism! So how does one begin practicing IMF? Let’s assume we are going to try the 16/8 Method. It’s pretty important to make sure your 8 hour window is the same every day. However, you can pick when your 8 hours are. Most people choose to eat 11-7 or 12-8, because they prefer to still eat dinner with their family. I do know people that eat 8-4, or even 7-3! Again, the time itself doesn’t matter, as long as it’s in your window, and it’s consistent each day. During your fasting time, the goal is to have virtually no calories. Black coffee is fine, tea, water of course is ideal. If you MUST have calories, you want to keep it fewer than 25. When getting started with IMF, you can work on transitioning yourself! Just push breakfast later an hour every couple of days until you hit your desired start time. The next important part of this is to make sure you are working towards eating less carbs and more healthy fat! This can help your body become fat adapted, which means it will start to burn fat for fuel! Once you are in your desired eating window that is where you want to stay consistently. If you have a day with an event that throws off your window, don’t worry about it! Just pick right back up the next day with your window. You can do this! 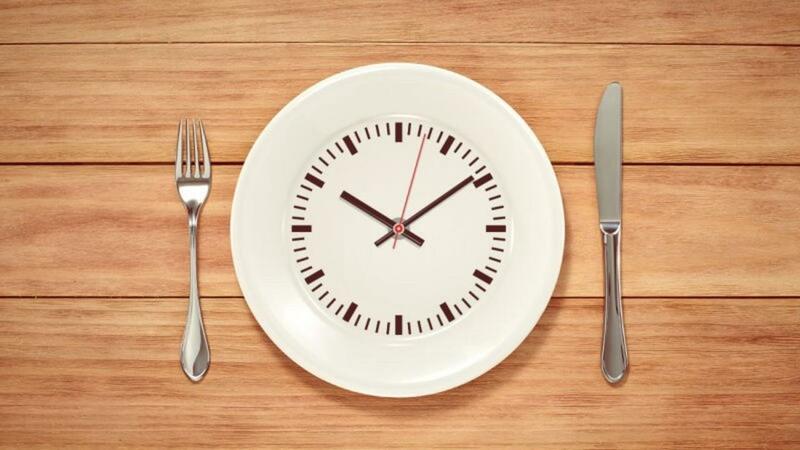 Want more information on Intermittent Fasting? Check out my mini course that will go into everything you need to know and help you get started, by clicking HERE! Or, to get that course for FREE along with several other resources to help you be successful with your weight loss, check out my monthly membership HERE!